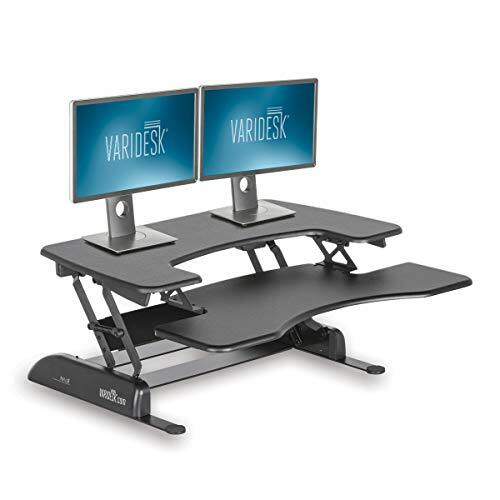 Your desk work experience just got a lot easier with the new dual tiered DESK-V000K height adjustable workstation from VIVO. 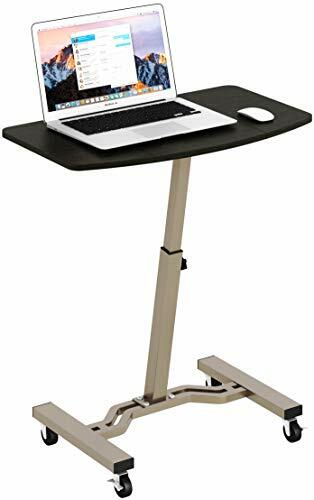 This height adjustable platform sits on top of your current desk and gives you the benefit of standing or sitting on demand. Transitioning between sitting and standing throughout the long work day provides numerous health benefits for the body such as increased blood flow and reduced aches and pains. DESK-V000K features a lifting mechanism which allows for simple and smooth height adjustments at the squeeze of a handle. The top platform rests 4.2" from your desk's surface at its lowest position and 19.7" when fully extended. The top surface measures 31.5" x 15.7" while the keyboard platform measures 11.8" x 31.3" allowing you to customize your work area and create the workflow you need. The tray is removable using the provided hex tool. 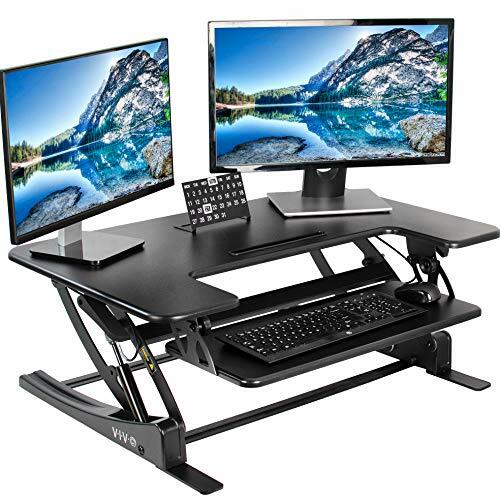 The weight capacity for the entire desk is 33 pounds easily holding multiple monitors or laptop and monitor combinations. The matte black finish helps the desk blend in with any environment and maintain a low profile. VIVO DESK RISER SOLUTIONS - We create affordable ergonomic solutions designed with creativity and quality to help transform your unique workspace! DESK-V000K is one of our top selling risers that sits on top of your current desk, allowing you to sit or stand on demand. QUICK TRANSITION - Go from sitting to standing in one easy smooth motion using the innovative simple touch height locking mechanism (adjustable range: bottom resting point at 4.2 and adjusts between 10.5 to 19.7 from tabletop). Design of lifting mechanism allows the desk surface to elevate straight up. SPACE EFFICIENT - The top surface measures 31.5 x 15.7, which maximizes space while still providing room for dual monitors. The 11.8 x 31.3 lower deck holds keyboard and mouse side by side. Customize your work area and create the workflow you need. SIMPLE ASSEMBLY - Very minimal assembly out of the box! Place on your existing desk and start organizing your workstation. WE'VE GOT YOU COVERED - Sturdy, high-grade steel design is backed with a 3-YEAR MANUFACTURER WARRANTY and friendly tech support to help with any questions or concerns. Here at VARIDESK, we know you want to feel great at work. That's why we created the ProPlus series to keep you comfortable, productive, and energized. We know you need flexible solutions that are durable enough for the long haul, and the ProPlus series is up for the challenge. SIMPLE: This desk was created to pop out of the box and onto your work surface. You'll be up and working more productively in no time. TRUSTWORTHY: When you buy through VARIDESK, you get our 30-day risk-free guarantee - which means you can be sure you'll love your desk. And don't forget our fantastic 5-year limited warranty! 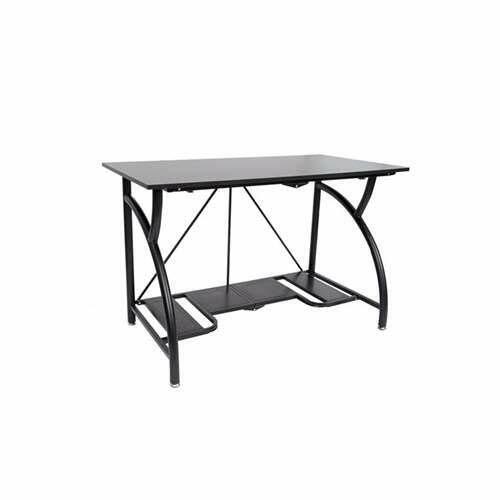 LARGE GAMING SURFACE - This gaming desk has a sleek carbon fiber texture and the gaming surface has plenty of space for your gaming monitors, gaming keyboard, and other gaming gear. The gaming surface measures 44.5" wide by 24.2" deep. BLUE LED LIGHTING - The Z1-S Gaming Desk comes with LED lighting. Plug the LED Lighting into your Gaming PC or Laptop with a USB. The LED lighting glows with a cool blue light for a better gaming experience. STABLE AND STURDY Z SHAPE DESIGN - We know how important your gaming gear is to you, that's why we designed this gaming desk with a rock-solid Z-shape design. It looks cool and its very sturdy. 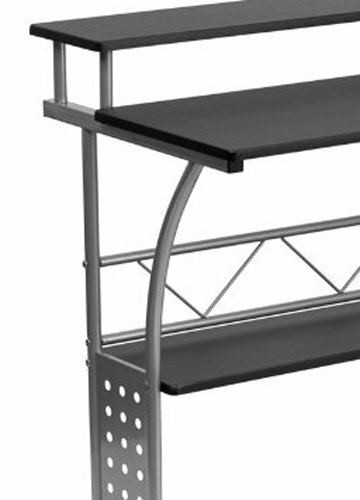 Comes with four leveling feet to make sure your PC gaming desk is level and stable. No wobbling. FEATURES BUILT FOR PRO GAMERS - This gaming desk comes with plenty of added features to help you have a better gaming experience. 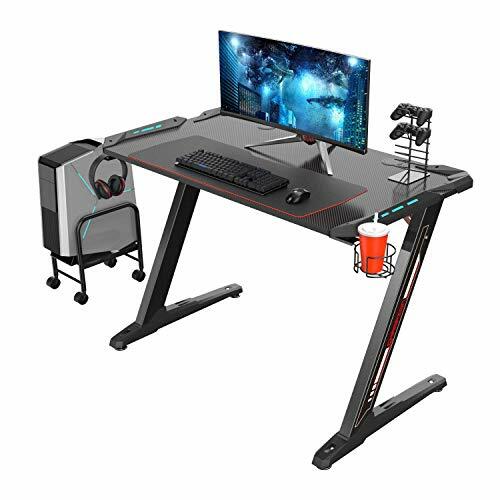 This PC gaming desk comes with a convenient cup holder, headphone hook, controller stand, and an extra-large mouse pad for your gaming keyboard and mouse. CUSTOMER SATISFACTION - We want to make sure we're designing and manufacturing the best gaming desks on the market. We manufacture everything in our own factory. We take pride in our innovative designs, rigorous testing, and our world class manufacturing process. We hold our products to a high standard and hope you have an excellent experience using our gaming desks. Our customer support team is in the U.S.A and we're here to help with any questions or support you may need. Enhance your workexperience with our height adjustable desk. 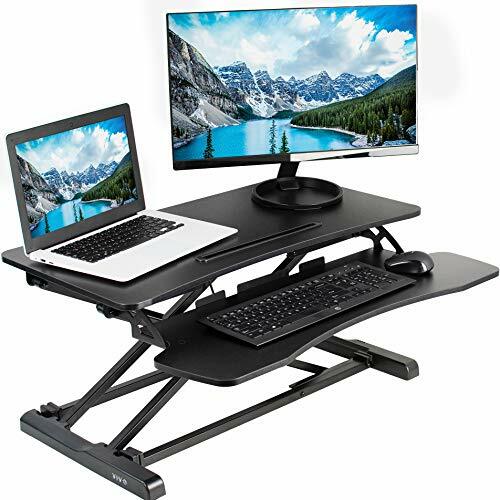 This dual-tiered standing desk sitson top of your current desk and gives you the benefit of standing or sitting ondemand. The keyboard tray of stand up desk is removable for user preference. Transitioning betweensitting and standing throughout the long work day provides numerous healthbenefits for the body such as increased blood flow and reduced aches and pains.Standing throughout the day also helps the mind stay alert and productive.Counterbalance. 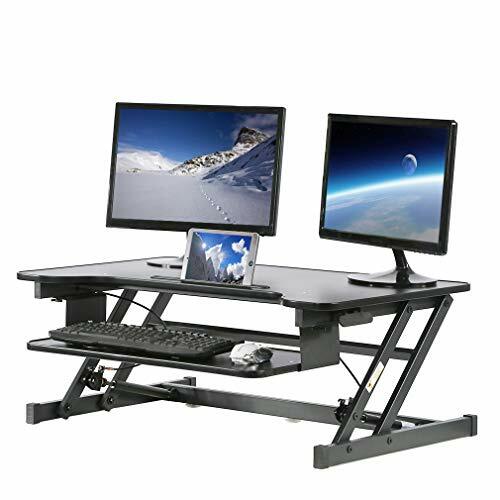 tension adjusts to the weight of your desk and everything on itfor easy upwards movement. Adjust to your perfect height level with unlimitedadjustable points between 6" and 13" from the desk surface. Adjustable height deskstanding desk standup desk with keyboard tray standing desk stand up desk gas springriser converter dual monitors desk standing desk standup desk with keyboard traystanding desk stand up desk gas spring riser converter dual monitors desk standing desk standupdesk with keyboard tray standing desk stand up desk gas spring riser converterdual monitors. L-Shaped Corner Design The simple L-shaped design fits any home or work office decor and is easy to switch the two tables as your habit, which can save your room space and take full advantage of desk space. Easy to Assemble & Maintain :All of the parts, tools for assembly and instructions are included in the package. It's easy to put together with instructions.And with wet cloth you can wipe dirty stain easily from the surface. Integration Design :WESTEROS L-Shaped corner computer desk consists of 2 different widths modular desks and 1 independent CPU bracket.It can provides you a modern and stylish atmosphere in work place. Durable Construction :WESTEROS L-Shaped corner office desk is constructed by steel frame and rugged and reliable mechanical design to ensure the excellent stablility of the desk. Customer Service & Guarantee If there is any questions please feel free to contact with us.If there is any part missing or damaged during shipping, please contact us first and offer us pictures of damaged part, we will solve the problem as the way you want(replacement at no charge or discount). 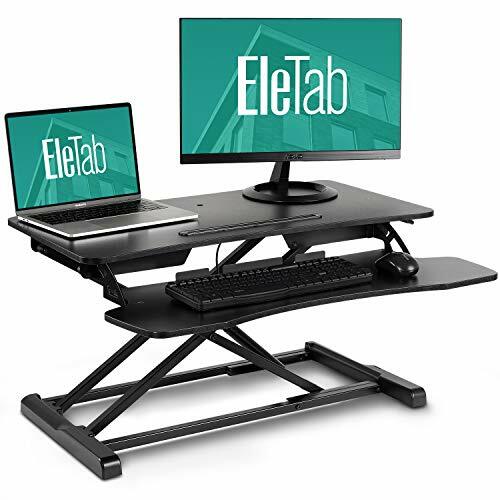 EleTab Desk Riser Solutions We create affordable ergonomic solutions designed with creativity and quality to help transform your unique workspace! This ELTAD-01 standing desk is one of our top selling risers that sits on top of your current desk, allowing you to sit or stand on demand. Quick Transition Go from sitting to standing in one easy smooth motion using the innovative simple touch height locking mechanism (adjustable range: bottom resting point at 4.2 and max height can reach 19.7 from tabletop). Design of lifting mechanism allows the desk surface to elevate straight up. Space Efficient The top surface measures 31.5 x 15.7, which maximizes space while still providing room for dual monitors. The 11.8 x 31.3 lower deck holds keyboard and mouse side by side. Customize your work area and create the workflow you need. Simple Assembly Very minimal assembly out of the box! Transforming your workspace with no complicated instructions or tools, simply place on your desk or table, and you're ready to work. We've Got You Covered Sturdy, high-grade steel design is backed with a 3-YEAR MANUFACTURER WARRANTY and friendly tech support to help with any questions or concerns. 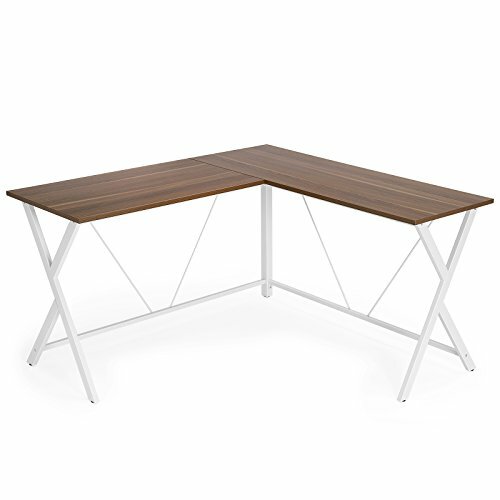 The Clifton Workstation gives you an upgrade to the simple writing desk. The large work surface allows you to comfortably use your computer and use writing materials. The raised shelf gives you more space by keeping working materials from off the work surface. Use the bottom shelf for your printer or CPU. [NAN-CLIFTON-BK-GG]. FINEST L-SHAPE COMPUTER DESK has 2 desktops to give you expanded space for working with your computer, laptop, playing games, or using as an office or student study desk. This uses very durable thickened board that is a full 18 mm thick. The strong leg tubes allow this desk to hold a lot more weight. We also added 4 metal bars under the tabletop to powerfully reinforce the structure for better stability. You won't get the shaking and vibration found with lesser desks. Just what you need for intense gaming and precision work. FASHIONABLE, MODERN LOOK gives you a great piece of furniture that blends well with decor and compliments your entire home or workplace. We use attractive black, walnut colored wood and materials for a look that blends well with any decor. This handsome desk will make both work and play more enjoyable and inspiring. You will get lots of compliments on this desk. EASY TO PUT TOGETHER. All the parts are clearly numbered. Consult the included directions for a quick and easy installation experience. Directions are clear with diagrams that are simple to understand, even if you've never assembled a desk before. In just minutes you will be enjoying your new L-shaped computer workstation. 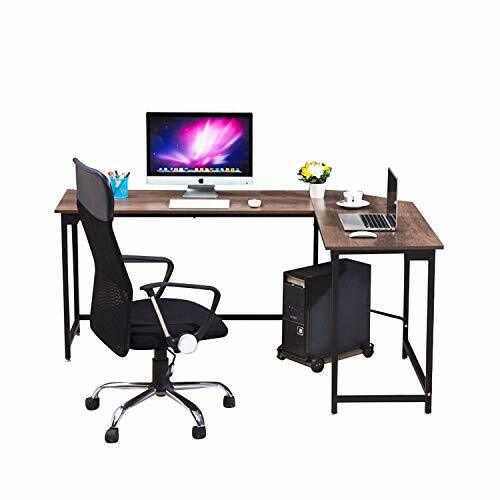 This our Tangkula professional gamers computer desk constructed by high quality density fiberboard with PVC surface and coated steel tube frame features high durability and good stability. And it's comes in with a monitor stand shelf, cup and headphone holder. Especially the built-in wire-management which contains 3 AC outlets, 2 USB ports. Spacious surface provides ample room for your monitor, PC, laptop, speakers and more. Specifically designed for all your gaming gear. Everything is strategically placed for your gaming pleasure. Super easy to clean and minor assembly required. Don't hesitate to add it to your cart! 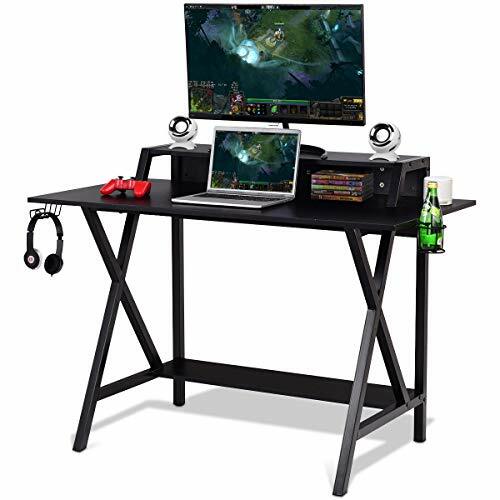 Unique & Smart Design Our Tangkula gamers computer desk comes with a monitor stand shelf, cup and headphone holder. Especially the built-in wire-management which contains 3 AC outlets, 2 USB ports. Spacious surface provides ample room for your monitor, PC, laptop, speakers and more. And monitor shelf dimensions- length is 36" left to right ,width is 8" front to back, height is 5" from desktop. turdy & Durable Construction Our Tangkula gaming desk is specifically designed for all your gaming gear. Constructed by high quality density fiberboard with PVC surface and coated steel tube frame which features high durability and good stability. It's equipped with an additional monitor shelf ,spacious desktop and a extra bottom shelf. Multi-purpose By using this Tangkula gaming desk that keeps all your gear in efficient order without hogging up a lot of space. Everything is strategically placed for your gaming pleasure. It's not only a gaming desk, also a Multi-functional workstation. Offers a contemporary style that adds a touch of sleek sophistication to any home office, dorm room or bedroom. Easy to maintain & Assemble With the smooth surface, you can easily clean the desk with a cleaning cloth. All of the hardware for assembly and instructions are included in the package. It's easy to put together with instructions. Customer service & Guarantee If there is any questions please feel free to contact with us, our experienced customer service team will response in 24 hours. We packed this set as good as we can, if there is any part missing or damaged during shipping, please contact us first and offer us pictures of damaged part, we will solve the problem as the way you want(replacement at no charge or discount).